This framed mini print by Daniel Moore is entitled “Coach and 315″ and is one of the latest mini prints offered by the artist.Up to now this print was only available in the large Limited Edition format and was well over 2000.00 dollars! !Finally this print is available to the public in a smaller open edition format and has been personally signed by the artist himself.It is Professionally Framed in a 1 1/2” Dark Cherry moulding with a gold lip and is double matted in crimson suede and black matting with glass and backing. 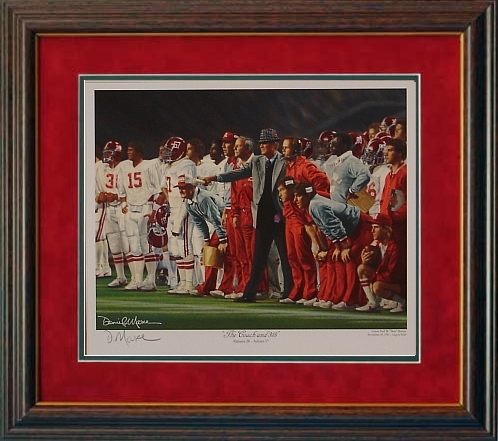 It measures approximately 15 1/2 17 and will be a great addition to any Bama fans collection.The date was November 28, 1981. It was three years and forty-one victories from the day Coach Paul W. “Bear” Bryant had publicly declared his quest for immortality- to become the “winningest coach in college football history.” Now, he needed only one more win to surpass the current holder of the record, Amos Alonzo Stagg of the University of Chicago. Stagg had amassed 314 wins against 199 losses and 35 ties over the course of his career. At the end of this day, and after a hard-fought 28-17 win over the Auburn Tigers, Coach Bryant would hold the record at 315.